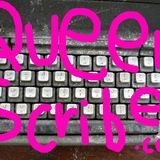 Queer Scribe Productions was first started when Miyuki Baker traveled around the world for 14 months to join the movement in creating a worldwide network of queer artists. You'll find publications on queer artists and activists around the world who are making change as well as her latest zines on yoga and meditation, pregnancy/chestfeeding and more. Click on the cover to read online for free or head over to etsy.com/shop/MiyukiBaker to get your own copy. Thanks!